the evening, you too ? Funky Funky Edits Are Still A Must !" Rest in peace! One of the greatest tape editors. WOW CAN'Y BELIEVE IT'S BEEN 20 YEARS ALREADY, A FRIEND LIKE CHEP YOU NEVER STOP MISSING. HIS HUMBLENESS, WIT AND HIS LOVE FOR MUSIC IS UN-CANNING. TODAY I WAS REMEMBERING ONE OF OUR MANY SESSION CHEP BB-KEYS AND I HAD (BB ON THE CASIO FZ-1 CHEP OR I AND THE SP-12OO OR THE AKAI 12 TRACK BOARD. AND WHEN WE RECORDED 970-CLUB "AYE-MAS" ON RAW RECORDS WHICH WAS THE VOCAL DEBUT OF CHEP NUNEZ HERE IS THE LYRIC B$#@CH! ONCE AGAIN THANK YOU FOR RECOGNIZING THE GENIUS OF THE WORK CHEP NUNEZ CONTRIBUTED TO THE ENTERTAINMENT INDUSTRY! family. Has my condolence new his. music editors. Thanks for memories! No one could make funky edits like chep. *Listen to some songs that he made with just this two otari. No Sampler, No Keybords. Only 2 Reel to Reel machines. *Y escuchan algunos canciones que el hecho con solo esto dos otari. No Sampler, No Keybords.Solo 2 Maquinas de Reel to Reel. Greetings to all. Today for the first time by FBL (Facebook Live) I will talk about this person José "Chep" Nuñez. They will know how to put it on my wall every year on this same date. I think the djs, producers, remixers and what they know about editing on tape or on their computer. They should know a little about the story. 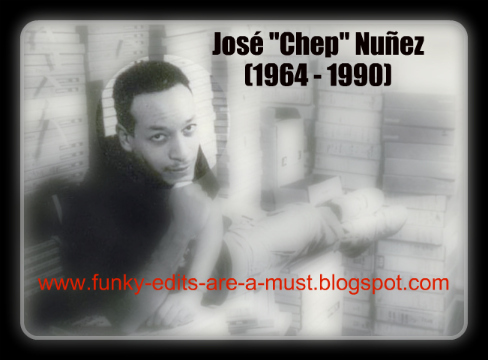 RIP #josechepnunez #editing #28thaniversario #respect #reeltoreel At 3pm puerto rico. 2pm EST time.